The Magog Cantonniers’ rearguard is considered the No. 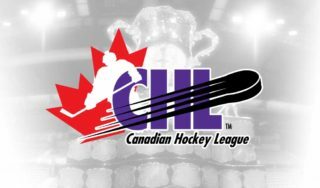 2 prospect heading into the 2018 QMJHL Draft and the Saint John holds the second overall selection. An excellent passer with a heavy shot from the point, Villeneuve also shoots right which is quite rare among defencemen. “It’s an advantage for me, but I can’t take any credit for it! I was just born that way, but let’s just say that my parents did a good job,” laughed Villeneuve. 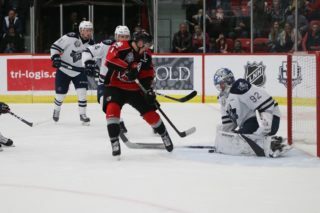 Villeneuve could also interest the Sagueneens at No. 1. To be honest, no team can really be able to overlook a player like him. “He has good offensive skills. He makes good decisions with the puck and knows how to find space. He’s got good size and uses his stick very well. 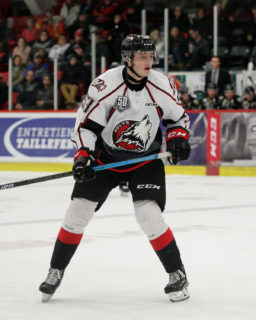 In my eyes, he’s a sure thing,” admits Director of QMJHL Central Scouting, Carl Bouchard. The 6-foot-1, 154-pound rearguard evaluates his reading of the play as his biggest asset. “I see the game develop. I’m not the type to deliver the hardest check, but I’m not afraid to use my body to separate a player from the puck. I’m tall and I use that to my advantage. I skate well, I’m very competitive, and I would like to improve my strength and the way I manage my energy,” admits Villeneuve. “We knew that William had a lot of potential. We had big expectations for him this past season, but we never imagined he would do all he did this past year. His meteoric rise and the role he took on for our team was huge,” explains his head coach and former NHL star goalie Felix Potvin. His attitude also makes him a strong pick. A Jimmy-Ferrari Cup champion with the Magog Cantonniers and Telus Cup finalist, William will never forget the season he just lived. 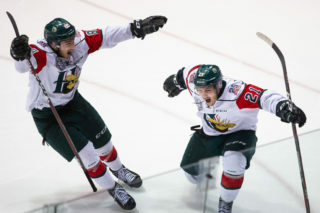 “We had a fantastic team both on the ice and in the dressing room,” said Villeneuve who amassed 34 points in 40 games before adding 15 points in 18 playoff games. 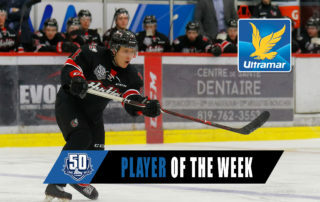 Midget AAA defenceman of the year and first-team League All-Star, he believes he is now ready to make the leap to the QMJHL.